So apparently I’m not that great at remembering certain holidays. First Pi Day, now Purim. There was also that time that I forgot my little sister Emily’s 9th birthday while we were both at summer camp, but I’m pretty sure she’s gotten over that. And technically Purim was before Pi Day, but that is irrelevant because, if you haven’t figured it out yet, there’s something you should probably know about me: I’m not that great at being Jewish. To be fair, I’m probably not much worse at Judaism than a normal Reform Jew. …Fine, maybe a little worse. Organized religion is just not a major force in my life. I do, however, very much like being Jewish. I may not be a particularly religious person, but culturally, I’m very happy to be part of the tribe. Jews have a rich cultural and culinary history, and I love being part of it all… especially the culinary part. Between brisket, matzoh ball soup, chopped chicken liver, blintzes, knishes, latkes, kugel, challah, schmaltz, falafel and, of course, bagels, Jews have cornered the market on delicious. Which brings me to those sweet little triangular symbols of Purim: hamantashen. The story of Purim centers around a King named Ahasuerus, his Queen, Esther, her good uncle, Mordecai, and a bad man named Haman. Essentially, the evil Haman hatches a plot to wipe out all of the Jews in the ancient Persian empire, but good Mordecai learns of the awful plan and teams up with Queen Esther (herself secretly a Jew) to foil Haman’s plans. …That’s the abridged version, anyway. At any rate, all’s well that ends well, and today, the festival of Purim celebrates the liberation of the Jewish people from Haman’s wicked plot to destroy them. Which brings me back to the hamantashen. Very simple and to-the-point, but really quite charming. Much like a little plate of hamantashen, actually. I really should have known better than to mess with years of Jewish culinary tradition, but mess I did. I tried to make my own version of hamantashen, using whole apricot halves instead of apricot jam, and using a shortbread cookie as the base instead of the traditional butter-less (!) cookie dough. Needless to say, it didn’t really work out as planned. I mixed and chilled the shortbread dough, cut it into thin cookie rounds, topped each circle of dough with a dollop of sweetened creme fraiche and half of a sweet peach (I couldn’t find any apricots at the store, fresh or jarred), and then pinched the doughy corners of the circular cookie to form a nice, hat-shaped triangle around the peach half. Success! …Nope. I don’t know if the peach halves were too big, or if the shortbread is just too heavy a dough to be molded like that, but my “hamantashen” just didn’t want to be shaped like triangles. “To heck with Haman’s hat,” they screamed when I pulled them out of the oven, looking delicious but defiantly round and un-hamantashen-y. “Fine!” I yelled back, biting into a warm, golden cookie and sopping up the peach juice running down my chin. I mean really, what did you expect? I told you… I’m not a very good Jew. Instead of looking like three-cornered hats, these cookies come out of the oven looking exactly like little sunny-side up eggs, which is actually how the recipe that inspired me means for them to come out. You know what they say: if it ain’t broke, don’t let Molly futz with it. Next time I’ll just skip the triangles and call these “sunny-side up cookies,” or else I’ll re-try the hamantashen with regular pie dough (instead of shortbread) and smaller fruit halves. You could use any stone fruit for these cookies – I bet they would be delicious with poached fresh plums. You could also substitute prepared vanilla pudding or pastry cream for the creme fraiche mixture. Either way, let me know how they turn out, three-cornered or otherwise. First, make the shortbread dough. Sift the flour and salt together in a medium bowl. In the bowl of an electric mixer (if using), mix together the butter and sugar until just combined. Add the vanilla, and then the flour/salt mixture. Mix on low speed until the dough starts to come together. Dump the dough onto a floured board and shape into a disk. Wrap the disk in plastic wrap and refrigerate for 30 minutes. 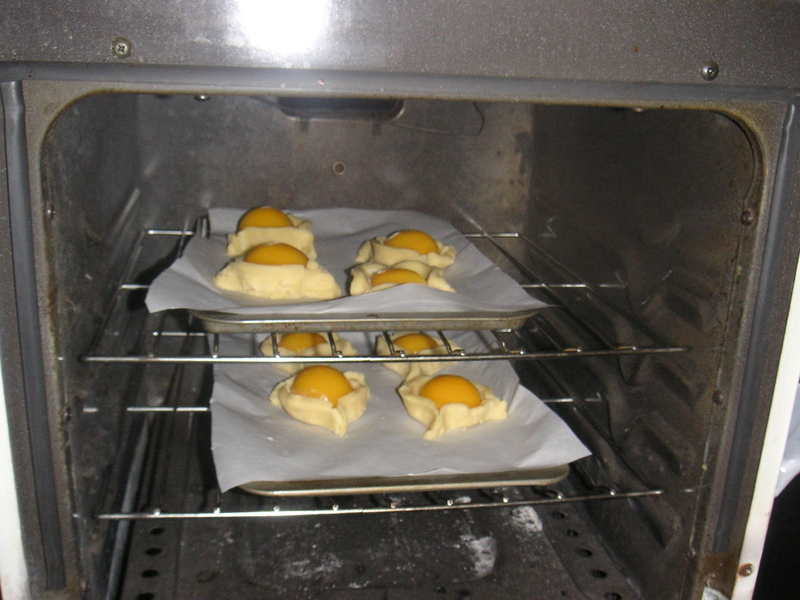 Preheat the oven to 350 degrees F. Line 2 small or 1 large cookie sheet with parchment paper. On a lightly floured board, roll out the shortbread until it’s about 1/4-inch thick, and cut large rounds from the dough using a cookie cutter or the top of a large cup or glass. Place dough rounds onto the cookie sheet(s). In a small bowl, whisk together the creme fraiche, vanilla, and sugar. Using a small spoon, dollop a spoonful of creme fraiche into the center of each round cookie. Place an apricot half on top of each dollop of creme fraiche. 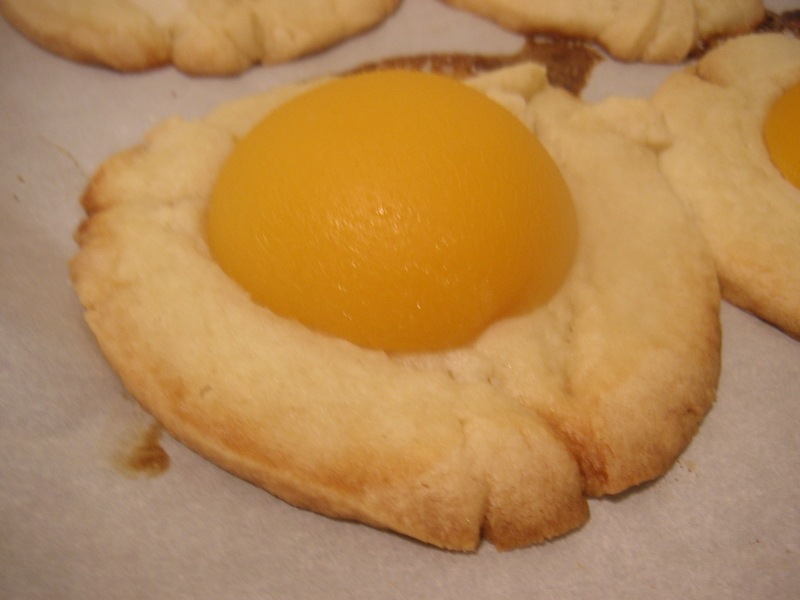 The cookies will now look like little sunny-side up eggs. Bake in the oven for 20-25 minutes, until the shortbread is lightly browned and the kitchen smells absolutely divine. Brush the fruit halves with apricot jam for an extra boost of flavor and to help them stay fresh and shiny. How much Wikipedia was consulted for the third paragraph? Joey: With Wikipedia, anyone can post anything about anything, so you know you’re getting the best possible information.